TORONTO, July 21, 2016 − York University and Southlake Regional Health Centre, together with the University Health Network (UHN), will work to develop new technologies to improve the health of Canadians using a $15 million investment from the Government of Canada. 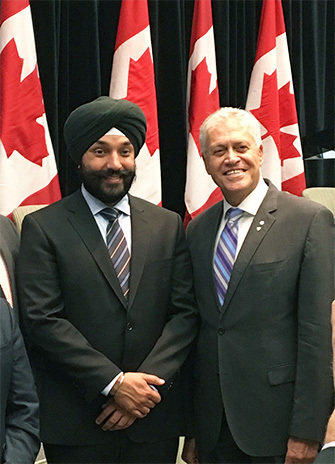 Today, the Honourable Navdeep Bains, Minister of Innovation, Science and Economic Development, and Minister responsible for the Federal Economic Development Agency for Southern Ontario (FedDev Ontario), announced the funding at Southlake Regional Health Centre. FedDev Ontario’s investment will be matched by $19.5 million from 32 partners that are developing three dozen new health-care technologies, resulting in a total budget of $34.5 million for the project. The project, The Health Ecosphere: An Innovation Pipeline for Commercial Health Solutions brings researchers and scientists together with business to develop technologies to coordinate healthcare across systems that previously operated in silos. York University’s Faculty of Health is the lead academic partner and administrative centre for the Health Ecosphere project. Southlake Regional Health Centre, the largest health-care facility in York Region, will be the lead clinical partner, and UHN will play a major role as a key academic partner. Each institution is leading a suite of technologies to be developed and commercialized. Working together, they will create a health technology cluster in York Region. York University collaborated with 18 partners on the Connected Health and Wellness Project, which also benefitted from significant federal government investment, and through that program developed a Certificate in Health Coaching program. With the new funding announced today, York’s Faculty of Health will expand its Health Coach Institute by producing specialized continuing education and training modules for students enrolled in the certificate program. It will expand its training currently offered to health professionals who want to add health coaching to their practice – such as nurses, occupation and physical therapists, chiropractors, pharmacists, social workers, emergency services workers, clergy and law enforcement. The new training modules will focus on emerging practice areas for the Health Coach – Aboriginal health, youth mental health, aging, obesity, and diabetes. In another York-led initiative within the project, Professor Paul Ritvo will team up with the Centre for Addiction and Mental Health (CAMH) and NexJ Health, Inc., a Toronto-based provider of health management software for patients, to test the effectiveness of internet-based, online interventions for aboriginal and non-aboriginal youth with diagnosed depressive and anxiety disorders. Ritvo has been researching youth-focused online interventions for five years and will be conducting two clinical trials.